Prosecco is the most popular sparkling wine in the world. Prosecco DOC is produced in the low-lying valleys of Italy’s Veneto and Friuli-Venezia Giulia regions. The art of cultivating vineyards in the fertile Prosecco area was developed over many centuries: the wine was already produced as far back as Roman times using the Glera grape, which initially grew near the village of Prosecco on the Karst hills above Trieste. At that time, it was known as Puccino. In the 18th century, cultivation of Glera expanded throughout the hills of Veneto and Friuli and later spread to the lower areas of Veneto and Friuli. This is where the Prosecco we know today was first produced at the beginning of the 20th century, thanks to the introduction of new secondary fermentation technologies. Prosecco DOC is made with the Glera grape and vinified using the Charmat method (also referred to as the tank method), in which secondary fermentation does not take place in individual bottles as in the Champenoise method (used to make Champagne), but in large steel tanks known as autoclaves, which keep the wine under pressure. This process was developed specifically to capture the fresh fruitiness of the Glera grape, as opposed to the yeasty, gently oxidized autolytic character of wines produced with the Champenoise method. The final result is a brilliant straw yellow wine with fine, persistent perlage and aromas of white flowers, apple and pear. It is fresh and elegant on the palate with moderate alcoholic strength. 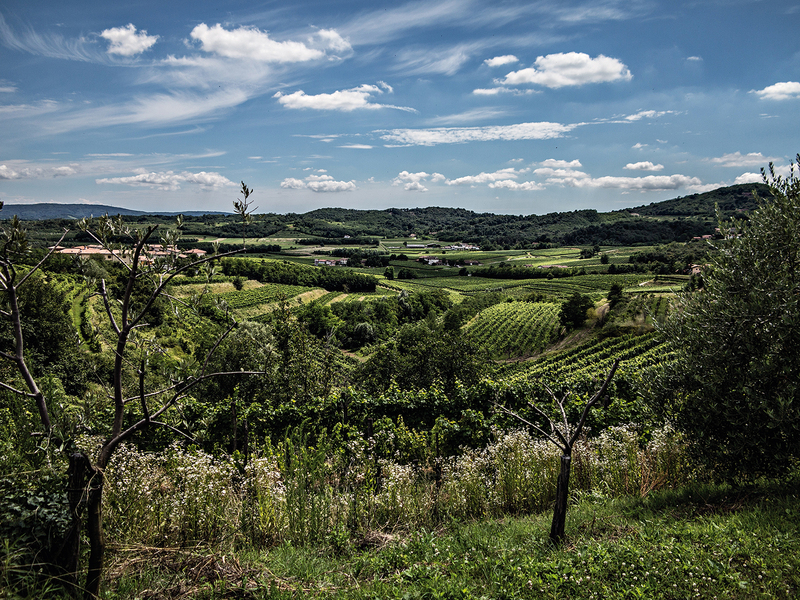 In addition to Glera, regulations allow the addition of a maximum of 15% of the following varietals: Verdiso, Bianchetta Trevigiana, Perera, Glera lunga, Chardonnay, Pinot Bianco, Pinot Grigio and Pinot Nero. The vines from which Prosecco is produced must grow exclusively to the area of North East Italy lying between Dolomites and the Adriatic Sea. 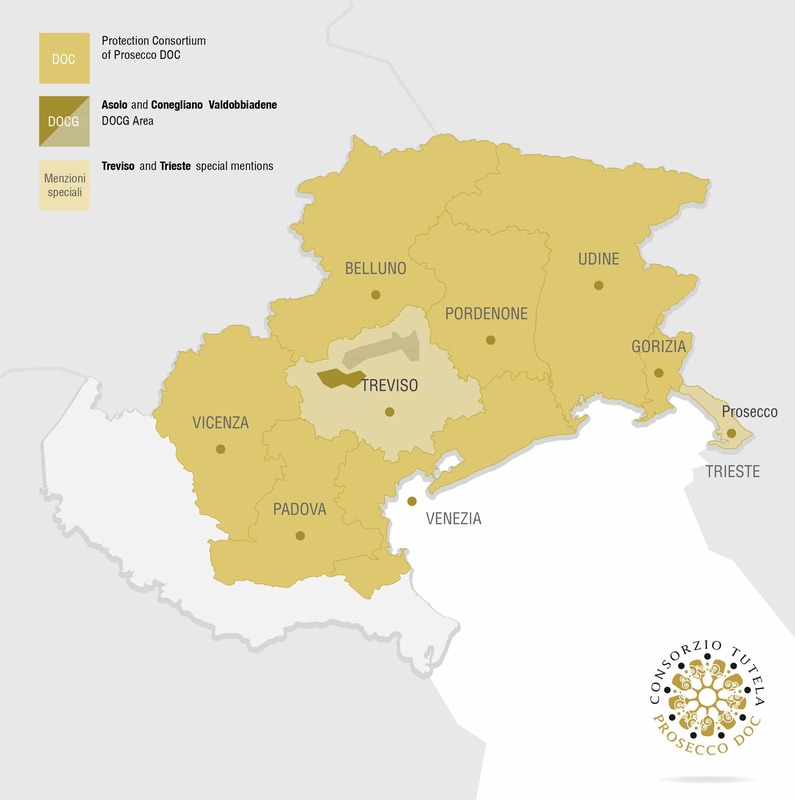 The grapes come from five provinces in the Veneto region (Belluno, Padua, Treviso, Venice, Vicenza) and four provinces in Friuli Venezia Giulia (Gorizia, Pordenone, Trieste and Udine). When the wine is also produced and bottled exclusively in the provinces of Treviso and Trieste, a special mention may be written on the label in recognition of the invaluable part these two provinces have played in the history of Prosecco. The grapes are harvested during the first weeks of September when the organoleptic qualities (sugars, acidity, and aromatic substances) have reached their peak. During this process, it is important to avoid spontaneous fermentations. After the grapes have been picked, they are crushed. The grapes are separated from their stems in preparation for pressing. The free-run must is extracted from the grapes by soft pressing. Selected yeasts are used to start the white winemaking process, transforming the sugar in the grapes into alcohol and CO2. The action of the yeasts (fermentation) lasts for around 15/20 days at a maximum temperature of 18°C to preserve the delicate aromas of the grapes. After fermentation, the ageing process begins and the wine is racked and filtered. Secondary fermentation takes place using the Charmat method in large containers called autoclaves which keep the wine under pressure. This is the process by which the wine gets its famous bubbles. Toward the end of the secondary fermentation process, which lasts a minimum of 30 days, the temperature is lowered to stop fermentation, leaving enough residual sugar to guarantee balance and harmony. The wines are finally bottled and labelled. Depending on the level of pressure, Prosecco DOC can be Spumante (sparkling), Frizzante (semi-sparkling), or Tranquillo (still) depending on the perlage. In the wines designated Spumante, the pressure is between 1 and 2.5 bars; in those labeled Frizzante, the pressure is between 1 and 2.5 bars; and in those labeled Tranquillo, the pressure is lower than 1 bar. After undergoing primary fermentation, Prosecco Tranquillo is bottled, while the Frizzante and Spumante varieties continue to the final unique stage in the Prosecco process: secondary fermentation in pressurized stainless steel tanks. Authentic Prosecco DOC is easily distinguishable by the state seal (pictured on the right), which must be applied on each bottle. The seal is applied onto the closing of the bottle in such a way as to prevent the seal from being used again and to prevent the contents of the bottle being removed without breaking the seal.